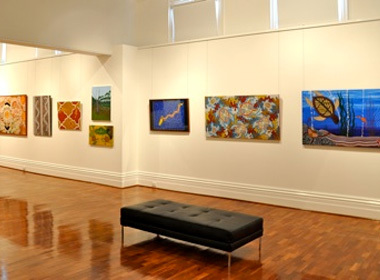 The annual CONFINED exhibition opened to the public on Thursday 10th January at the St Kilda Town Hall gallery, with a celebratory launch scheduled to take place on Wednesday January 30th from 6pm – 8pm. Now in its fifth year CONFINED features contemporary artworks by Indigenous artists currently in, or recently released from, a Victoria prison and is a key feature of Yalukit Wilum Ngargee, Melbourne’s oldest annual Indigenous cultural festival. 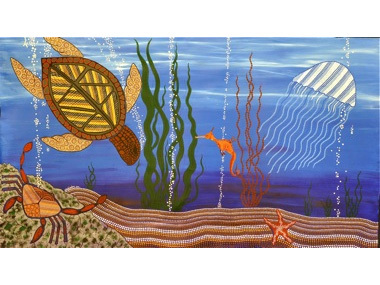 Following the success of the early CONFINED exhibitions community arts organisation The Torch established the Indigenous Arts Officer in Prisons and Community Pilot Program which focuses on the role of culture in the rehabilitative process. Featured artist Shane Lovett says, “It is empowering to be known as an artist. Painting is a part of our healing. It helps us get through,” says Lovett. The 18 month pilot, which culminates in CONFINED 5, generates opportunities for people to foster new networks to exhibit and sell their art works and increase levels of legitimate and self-generated income. In Victoria, Aboriginal people are 14 times more likely to be incarcerated in the adult prison system than non-Indigenous people. In Australia an Aboriginal person is statistically more likely to go to prison that to complete high school or go to university. The Indigenous Arts in Prisons and Community program is working to reduce this number by building sustainable post-release pathways. “When you are on the inside, just having that connection with someone outside is so important. Sharing ideas creates stronger ideas. And then when you are out of jail, it’s so important to have ongoing involvement,” says CONFINED artist, Dennis Thorpe. Kent Morris, CONFINED 5 curator and coordinator of the Indigenous Arts in Prisons and Community program works across 12 prisons in rural and metropolitan areas of Victoria. “There are limited cultural resources inside and many of the artists crave a deeper understanding of the artistic and cultural practices of their mob so I bring in cultural information and research material,” says Morris.